You can get more stats and information by visiting the link below or clicking on the above picture. Spoil rate ----------------- 0.4x Lower number means slower spoiling. Crafting speed ---------- 0.4x Lower number means faster crafting. 1. No PvP on south side of river near newb spawn area. This rule is for lowbies to progress without being discouraged. 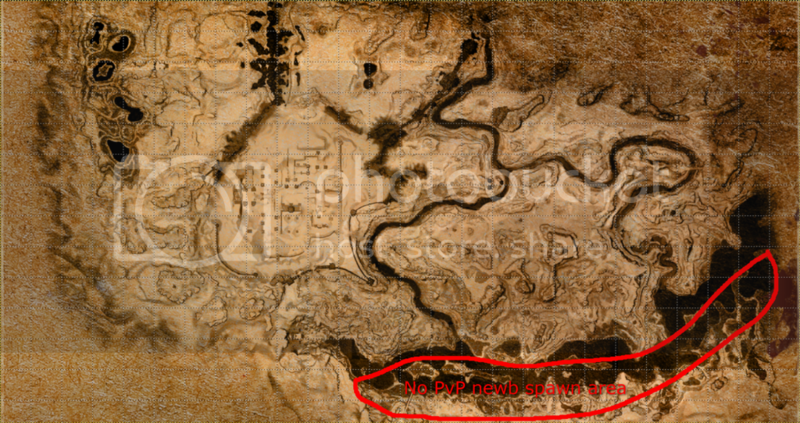 Picture below shows off limits new spawning PvP area. 2. Be polite to all players on server. No getting mad because you were PKed and talking smack in voice or global chat. 3. Destruction of player bases is allowed but only during set time frames. 4. No camping of other players bases. During siege open times this is not considered camping if you are trying to break in for raiding. If caught camping outside of siege window time player will be warned up to 2 times. Actions will be taken after the 2 warnings have been issued. 5. More rules will appear here so please check back.